It's official. After 3 years of hiatus with the last race in 2010, the iconic race known as IRONMAN Triathlon is back in Malaysia. This time, to complete the "Package", the inclusion of the shorter Half-Ironman or better known as Ironman 70.3 will take place months before the actual event in September. In the coming weeks and months, I will start bumping up my triathlon specific training and I am in the midst of "creating" one tailored specifically to pull myself through this race. It is no easy race and it is one hell of a journey for me. My best ever timing was a slow 15:00 hours which include a full 1 hour in transition to clown and cheer my fellow Ironman on. My slowest were almost at cut off of 16:48 where I struggled and pushed on despite a lower than usual blood-iron level of 7mg/l. The race course and the details could be obtained from the Ironman webpage here . What I am doing is to utilise Garmin Connect and to get a feel of the elevation of the race. So we now know swim is in 2-loop triangle and no more the out 1.9 and back 1.9. It mentioned swimming past Eagle Point and it starts at Pantai Lagenda, right next to the jetty/marina behind CHOGM Park. Bike according to the description is anti-clockwise around Gunung Raya via Jalan Ayer Hangat. Towards Jalan Teluk Yu and a little ahead past Jalan Datai, is the U-turn 1 and then head until the end of the road at Datai for U-turn 2, back track to Jalan Ulu Melaka and up towards Bukit Antu, which is the climb of Lebuhraya Langkawi before heading back to transition for U-turn 3. Repeat. Sizeable climb with total of 6-peaks with total of about 900m elevation gain (about 450m per loop). With this elevation profile, the best training route will be the Broga Loop. Guess this will be a staple ride for months to come. The run loop has been refreshed with a totally different route. It is a little bit of a turn-off if you ask me as the route along Jalan Penarak where most of the supporters will be has been taken away and participants will run along a back-road towards the stadium, avoid the main traffic altogether. Perhaps this change will be good. Maybe. I did not map this out as it is not possible due to the road/no-road conflict on Garmin Connect. 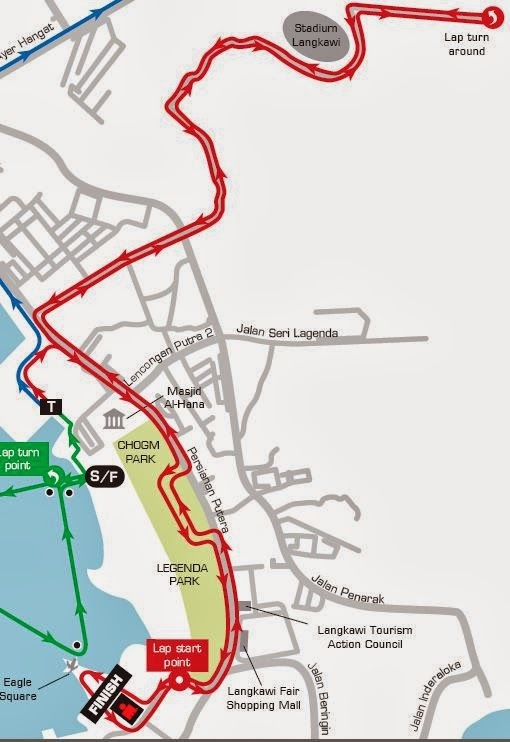 If you are wondering, the run route will be along the moonson/river and running through a smaller road (kampung/village) towards the Stadium and back out. 4 Loops and you will be passing the finishing point 4 times. I would much prefer the old route where it is actually nicer with more crowds. Too early to assume this is not a better route. So, lets all see during race day. Swim is more open compared to the years before where the route is covered by the bay and the jetty. Being monsoon month, expect a little rougher water, but nothing more practice would not help. Biking will be under the hot island sun and expect to be burn. Looking at the route, most of us know Jalan Ayer Hangat is pretty covered and the Datai portion is a bit winding and open. Running will be totally new. Running through the park at night we hope the route will be nicely lighted. Many hi-5 opportunities and perhaps respite from the humidity and heat in the late afternoon/early evening. Less dusty definitely. 17hours? That will be more than sufficient if you start your training now. Average timing predicted will be about 14:30 for most. Expecting Pros to finish here in 8:30hours. Heat and humidity will be the biggest hurdle for those not acclimatized to tropical weather. Here are a few hotels within the race start you can consider. 2. Seaview Apartment - Just down the road from Seaview Hotel and right before the turn off to Jalan Ayer Hangat, these apartments has three-rooms and cost anything between RM250/night to RM500/night depending on the owner and the website hosting the rental. Coming in large group? This could be a perfect place to be. 4. Eagle Bay Hotel - For 2014, this is right smack in front of the race start (Pantai Lagenda) and it is one of the cheaper hotel along the main road by virtue of old age. I stayed here in 2008 paying USD30/night or about RM100/night. Not too bad if you can stand musky carpet smell. Perhaps, the hotel has seen some upgrade. 5. Hotel Bahagia - Behind the KFC near town, it is a shoplots turned Hotel. Room with no windows. If you are used to stay in cubicle, this RM90++ rooms is alright. Gets really tight with two bikes and two people inside. Shower and Toilet is integrated. 6. Westin Langkawi - the swankiest hotel within race start/end. I stayed here courtesy of fellow friend (you know who you are) and had breakfast with Belinda Granger. More info at the Ironman official website here. Registration open 2-weeks from today. For those of you that has waited like me, it is time for you to make the decision. I made mine and I will be signing up when it open for race entry. It will not be the same cheaper than usual RM500 but it will be USD550 - a hefty MYR1760 at today's exchange rate of MYR3.20. But it will be WORLD CLASS with no local goons that has destroyed the race in 2010. 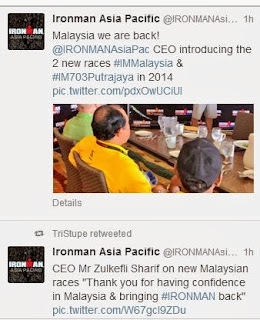 As many rightly pointed out as such, Ironman is an international race. You pay international price. There should not be any "local bias" and we all should be competing against the world on level ground (actually, being local, you already acclimatized). Time to end the Jaguh Kampung mentality. See you all at training, and hope to see you at Race Check in September 25, 2014. I cant even swim more than 200M. Macam mana mau masuk Ironman? I am a newie in a full Ironman. However, I will be in Langkawi next September!!! Does anybody know if it is allow to use a wetsuit during the swimming? And thanks for the details on the race and course. Question for you on the bike route, what sort of gradients are the climbs (on average and max). What type of bike did you do the course on - road (with aero bars) or TT/Tri bike? Also curious about the wheels you were running considering the 900m of climbing that's involved over the entire route. 1. Average about 5% grad. Max about 15%. 2. I've tried both. Depending on how much you can stay on aero if you ask me. 3. Zipp 404. Seen pro using full disc. No issues. More to come sir and thanks for the wishes. You too. Pleasure all mine. See you in September! Thank's for u r explanations. I was in Malysia in 2004 and i cam from Switzerland and the description is important for me. Many thank's and sproting greeting.